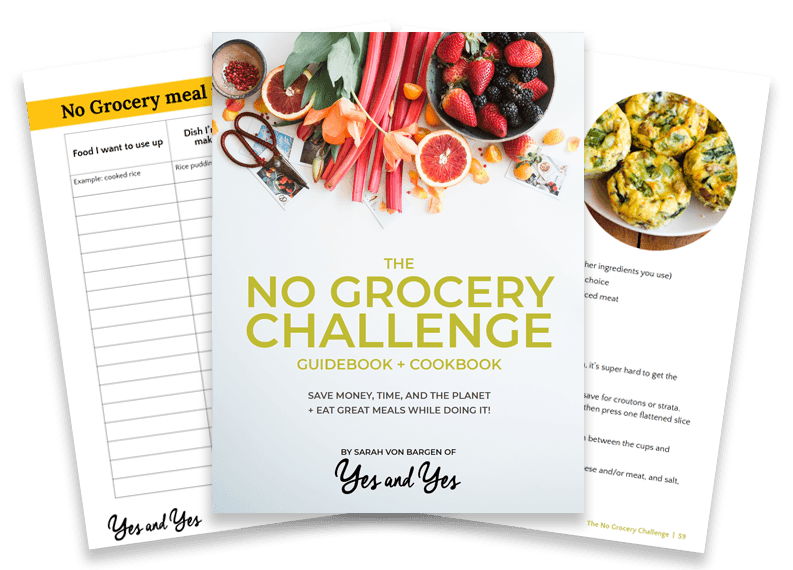 73 pages later, I’d created The No Grocery Challenge Guidebook + Cookbook: Save Money, Time and The Planet + Eat Great Meals While Doing It. Click here to download your copy so you can use all those Christmas leftovers! Actual fact: the average American family of four spends $1,500 a year on food they don’t eat. That’s a mortgage payment! Or a vacation! Or 300 lattes! Let’s say you usually spend $80 a week on groceries, $320 a month. If you did a No Grocery Challenge one week each month, you could save $960 a year! Also: Every time I go to the grocery store to “just quick grab something,” I leave with five other things. I run in to buy a 60-cent lemon and emerge with $22 worth of groceries. So if you can learn to visit the grocery store less, you’ll probably spend less overall because you won’t be seduced by the siren song of discounted cheese. Even just “popping to the shop down the street” is usually twenty-minute endeavor, when you factor in parking and standing in line. When you learn how to cook with what’s on hand, you’ll save yourself so many last-minute trips to the grocery store. Also, many of us exchange our time for money. The more we work, the more money we’re paid. If you could reduce your grocery bill by $80 a month – depending on your salary – that could be the equivalent of one day’s pay. You could take an unpaid day off, sleep in, go to the beach – and not feel it in your bank account! It’s so, SO easy to fall into the rut of rotating through the same 10 recipes every few weeks – pizza, pasta, salads, tacos. Lather, rinse, repeat. It feels so good to open the cupboard doors on any given weeknight, glance at what you’ve got, and know that you can throw together something easy, healthy, and delicious. You don’t have to run to the store. You don’t have to page through five different cookbooks. You don’t have to engage in an hour-long “I don’t know, what do YOU want” conversation with your partner. You know what you’ve got, you know what you can do with it, and you know that the end result will be awesome. Awesome! Unless you live in Hawaii, the pineapple that’s rotting in the corner of the fridge probably wasn’t grown down the street. Neither were the mid-January raspberries or bell peppers. All of the above made their way to our grocery stores via planes, trains, and automobiles, consuming fossil fuels as they went. So when we don’t eat food that was grown thousands of miles away, we’re not only wasting food. We’re wasting all the fuel that was used to get that food to us. Is a No Grocery Challenge just … eating from your pantry? “Sarah, I don’t need an ebook to remind me to use up the pasta I have in my cupboard, THANKS.” <- I can hear you thinking this. 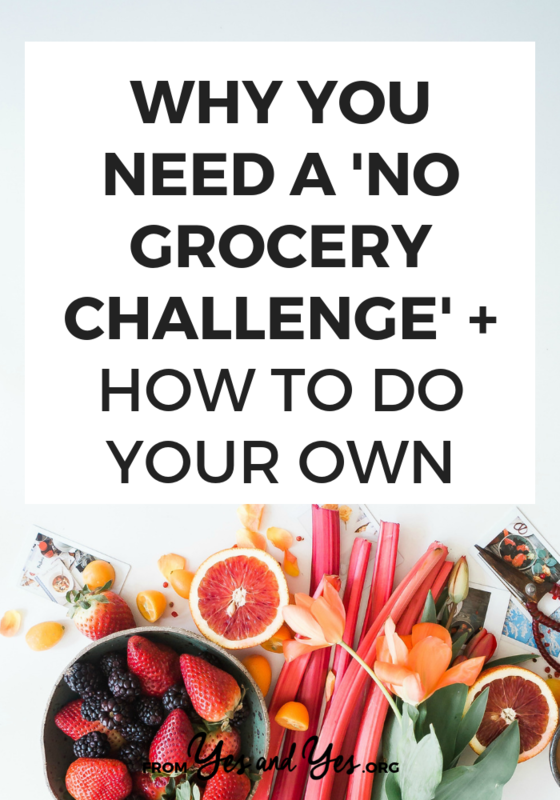 There’s actually a lot more to doing a No Grocery Challenge than that. How do you do this in a way that feels fun and creative, not boring or overly virtuous? How do you grocery shop in a way to leads to less food waste in the first place? Are you storing food in a way that makes it spoil faster? Are there recipes + cooking methods you don’t know about that would make your ingredients sing? Can you resuscitate that bagel/broccoli/bunch of celery so it’s almost good as new? This is a great post-holiday gift to yourself, the planet, and your bank account. For the average reader, this ebook pays for itself in three meals! Click here to learn more. As always, thank you so much for supporting Yes & Yes and the work we do here. It means so much to me! This is a great challenge to take on – I often overbuy when I go grocery shopping! Thank you for the idea and tips! Sadly this is a lot harder for folks with dietary restrictions. I’m on a low histamine diet and I have to eat as fresh as possible, and even leftovers can make me sick. It stinks when so many money saving or time saving tips just aren’t possible due to an illness or disability. Raise your hand if you immediately googled “savory oatmeal recipes”! Going to try some this week! Thanks for creating this Sarah. Over here in the UK we face the very real possibility of disruption to the food supply chain next year following Brexit, so I’m keen to get better at meal planning and making sure my cupboards are well stocked in advance. So store cupboard recipes, particularly if they require no fresh ingredients are very welcome. You might want to check out the work of Jack Monroe (https://twitter.com/BootstrapCook), a UK food writer and campaigner whose experience as a food-bank user prompted them to find very creative ways to make tinned goods into appetising and nutritious meals. Oooh, thanks for the head’s up! Super interesting!